I optimistically grow Boc Choi every year and every year it is consumed by bugs before I get to it. This year however I won and was able to get three uses. The plants have now bolted and flowered but are the leaves still good for stir frying? I pulled all the plants up and saved most of the leaves but do not know if they are still good. stir fry has so many other flavors that I think you could still eat the leaves and not even notice. if they taste bitter raw you may get a hint of bitterness when cooked. I've done several Asian greens and have luck with Toy Choy and Tatsoi. These are best direct seeded...plants may bolt early when transplanted. Dipel is needed to protect against the cabbage worms. I did cook them last night and they were OK but much stronger flavor than i thought. Anyway they are done for the year and beets are going in today. I like cabbage, but want something faster. I do not like kale, although it grows like a weed for me. Looking at the catalogs; anybody have any feedback about boc Choi? Or any of the other Chinese cabbages? Suitable for a cold frame? Or they like cold? 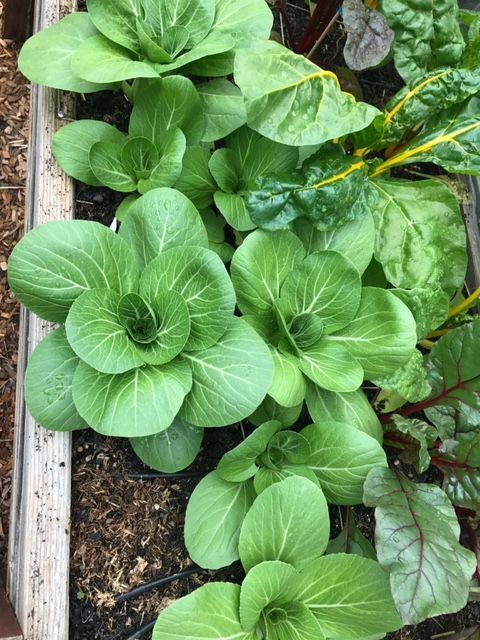 SR, I grow what is commonly called Napa Cabbage (Johnny's Seed Rubicon), which doesn't require a cold frame since it grows well in cold weather. I start it indoors, and plant it outside a couple weeks before the last frost date - it easily grows through temps down to 30°F or a little lower. I like it is because the leaves are edible while a young plant, providing early season greens, and when the plants are set outside they only require 6" spacing. When mature, the "heads" are about a foot tall. They are heavy feeders, and need rich soil. Bok choy is a good winter plant. I just pick off the outer leaves and let it keep growing. It survives down to 28*F without protection. We have only hit freeze temps once this winter and it is already bolting with beautiful yellow flowers. November 26. Thanks! I really like cabbage, not so in love with kale, so trying to decide what to grow. Anybody willing to send me a few seeds? I will trade! I will post on the seed traders page also. @sanderson wrote: Bok choy is a good winter plant. I just pick off the outer leaves and let it keep growing. It survives down to 28*F without protection. We have only hit freeze temps once this winter and it is already bolting with beautiful yellow flowers. November 26. SR These are "toy choys". PM me with your address if you want to try them. @sanderson wrote: SR These are "toy choys". PM me with your address if you want to try them. Yes, how many/SF? I only need one square’s worth of seeds. Info is on the packets I made. @sanderson wrote: Info is on the packets I made. Thank you! I personally love homemade envelopes...what’s wrong with me? Lol! OK, strike that. Oh, they aren't the cute little designer packets. Just 3 paper envelopes of seeds in a 3"x4" zip lock baggie. I wanted to keep the seeds dry in the winter weather (fog, rain, snow . . . )I mailed 3 varieties of toy choys. @sanderson wrote: Oh, they aren't the cute little designer packets. Just 3 paper envelopes of seeds in a 3"x4" zip lock baggie. I wanted to keep the seeds dry in the winter weather (fog, rain, snow . . . )I mailed 3 varieties of toy choys. YAY!!! Can’t wait to give them a try! I hope you get them! @sanderson wrote: I hope you get them!